Best Paleo white chocolate macadamia nut cookies! You ask why? 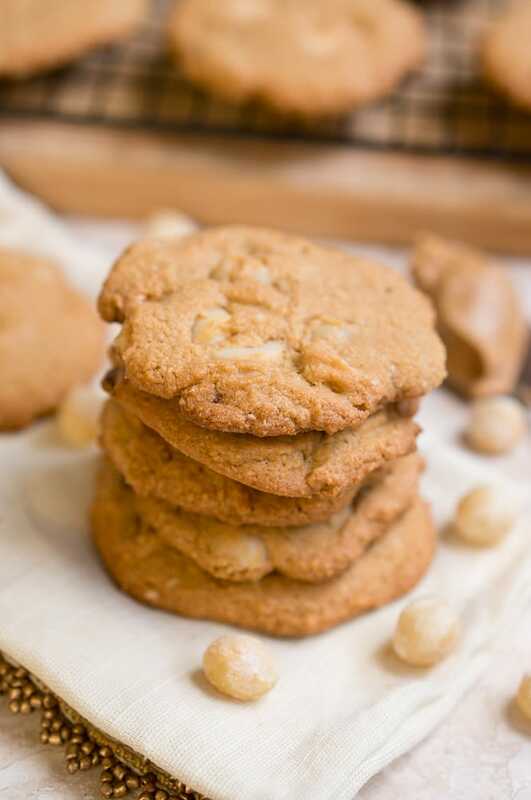 They are a great combination of macadamia nuts, white chocolate chips, and almond butter! And even though they are flourless, they are crispy on the outside, soft, chewy & gooey on the inside, and taste amazing! I mix almond meal, almond butter, 1 egg, maple syrup, coconut oil and baking soda to create these delicious cookies. 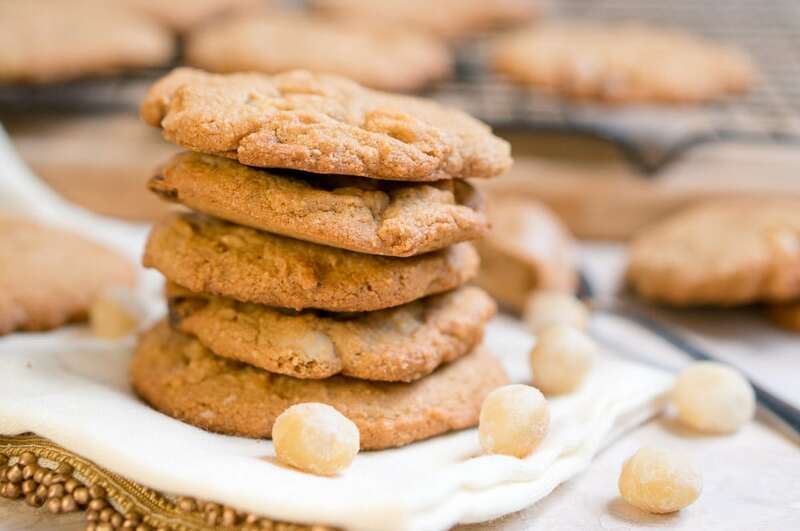 These Paleo white chocolate macadamia nut cookies also don’t have any added refined sugar. 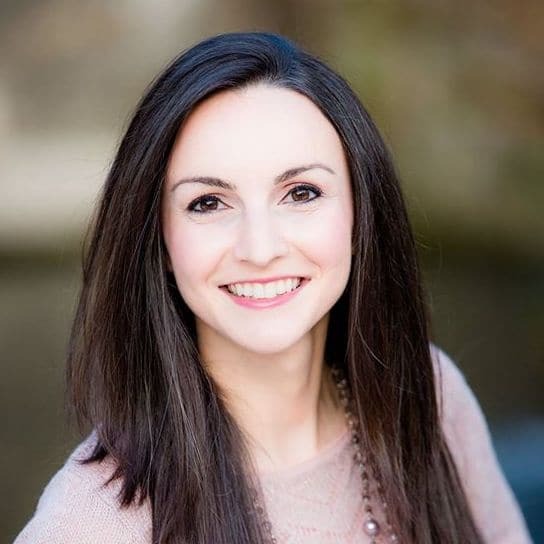 Sugar can have harmful effects on metabolism and contribute to all sorts of diseases. It can cause insulin resistance, diabetes, it raises your cholesterol and can give you a heart disease. It also influences your hormones, your brain, it can make you feel hungrier and the liver converts excess sugar into fat. That’s why I try to stay away from refined sugar. I try to satisfy my sweet tooth with naturally sweetened desserts, fruits, and honey/maple syrup sweetened treats. 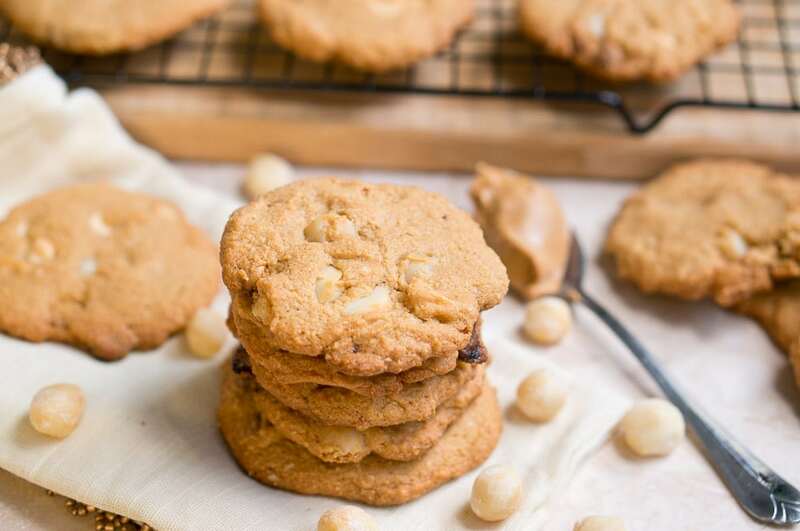 I hope you enjoy these Paleo white chocolate macadamia nut cookies! They are perfect for a family get together, for a holiday party, or for the cookies lover in your life. Mix almond meal and baking soda in a medium mixing bowl. In another mixing bowl, mix wet ingredients – coconut oil, maple syrup, almond butter, egg, vanilla extract. Add wet ingredients to dry ingredients and stir until smooth. Add chopped macadamia nuts and white chocolate chips to cookie batter, and stir to combine. Using a cookie scoop, place cookie balls on two parchment-lined baking sheets. Flatten the cookie balls slightly using a fork. Bake at 350 F for about 8-10 minutes. They will be soft when you take them out of the oven. Let them cool on a cooling rack for at least 10-15 minutes. They will be chewy and gooey on the inside and firm on the outside. Enjoy! I love macadamia nut cookies, and I had to come up with a recipe that tastes awesome but is free of sugar and flour. These are perfect. 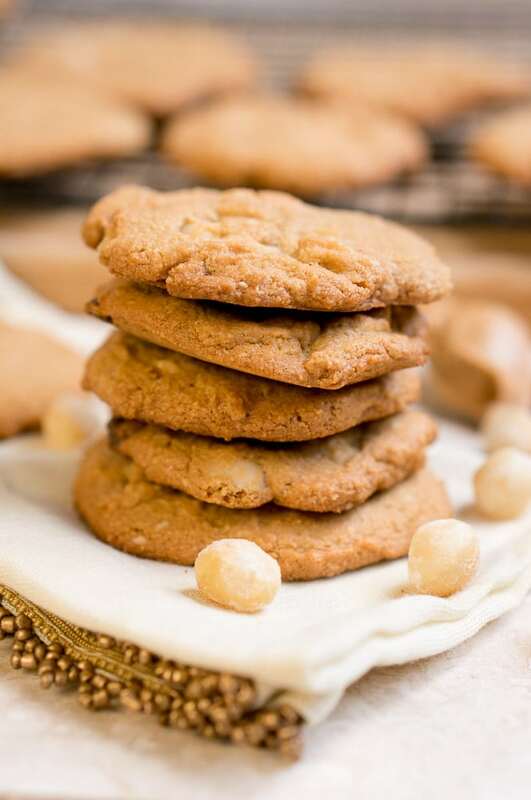 These Paleo white chocolate macadamia nut cookies are fantastic! these macadamia nut chocolate cookies are fantastic! Chewy, gooey and so delicious! In another mixing bowl, mix wet ingredients - coconut oil, maple syrup, almond butter, egg, vanilla extract. These cookies look so delicious and healthy! The fact that these are paleo is even better! Great share! These cookies look amazing, Nelli! Love that they are paleo! Love the almond, macadamia and white chocolate combo! Oh, these are calling my name! 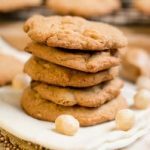 I LOVE white chocolate and macadamia cookies — thank you, thank you, thank you for making them Paleo! I am crazy about macadamia cookies too! 🙂 So, I had to try to make them paleo, and I m so glad they turned out great! I love white chocolate and macadamia nut cookie and I love that these are paleo! They look delicious. Thanks, Rachel! 🙂 thanks for stopping by! Wow these are gorgeous!! I can’t believe how easy they are!! Pinning! Omg! YUM! I need to try this ASAP! I love macadamia nuts. These cookies look incredible! I seriously can’t believe they’re paleo. I’ve bookmarked them so I can make theme asap!! These are delicious! They even look like normal (non-grain-free) cookies. Hi Savannah! The white chocolate used in this recipe is Paleo. You can find a recipe here. Honey and maple syrup are just as bad (not as processed but higher glycemic than sugar)…is there something like stevia or erythritol that could replace it? How would you replace the liquid? I’m craving these after people bringing in the grain and sugar loaded ones to work! You could probably use stevia and add a little bit more coconut oil to get the right consistency, or 1 more egg. I haven’t experimented making them honey-/maple syrup-free yet. If you give them a try, let me know how they turn out. I made these cookies last night and they are delicious! Thank you for sharing this recipe. I substituted Agave Nectar for the maple syrup. My hubby loved the cookies too and he’s not a fan of anything sweet!